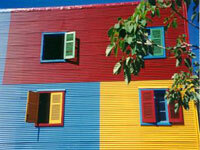 La Boca (The Mouth), situated in the south-east of Buenos Aires at the mouth of the Riachuelo river, is the most colourful neighbourhood or barrio in Buenos Aires, original home of both football legend Diego Maradona and the tango. An assortment of brightly-painted houses made of wood and metal line the streets, including the famed main street Caminito, in this poor but happy area full of artisans, painters, street performers, cantinas and open-air tango shows. The neighbourhood was originally settled by Italian immigrants from Genoa, most of whom came to work at the docks. Residents today are still mostly of European descent, from Italian, Spanish and French to German, Arab and Basque. Today it is frequented by crowds of tourists who come to soak up the lively atmosphere, watch tango dancers on the streets and squares, and sit in picturesque cafes sipping coffee and beer. La Boca residents are independent and fiery, as evidenced by their short-lived 1882 secession from Argentina that was immediately ended by the president. The area has been home to radical politicians over the years and saw many demonstrations during the unrest of 2001. Some places of particular interest in La Boca are La Ribera theatre, and La Bombonera, the home of the famous Boca Juniors football club.